Everything in tech (and yes, that includes event tech) is a race for attention. When it comes to mobile event apps and event technology of all varieties, event professionals know exactly how true that sentiment is. If an event app isn’t useful, engaging, and valuable, then efforts to encourage attendees to download and use the event app will be futile. Search the Google Play or iTunes stores: there are thousands of event apps. So what are the features that attendees want to see and experience within their own event’s app? One of the things event attendees anticipate most is meeting others with whom they could potentially do business. Whether the event is focused on connecting suppliers with buyers or connecting attendees 1:1 with other attendees, personalized scheduling with MeetingPlay allows these important interactions to happen and be scheduled, all within the mobile event app. This 1:1 engagement option within event apps can be customized based on user specifications. Filters such as company name, job function, title, and others can be selected by the event app user, allowing attendees to discover who they need to talk to, eliminating missed opportunities. For event app users with iOS devices, confirmed appointments can be exported to calendars such as Google Calendar or Microsoft Outlook, as well as have push notifications enabled to remind the attendees of upcoming events, sessions, and these custom meetings. iBeacons are one of the biggest game-changers when it comes to event technology and how attendees, vendors, and event professionals experience an event. A frequently requested use of iBeacon technology within mobile event apps is for attendee networking. Wearable iBeacons can be used to allow attendees to connect with others, replacing the need to have thousands of business cards printed before an event. Here’s how it works: Attendees pre-select other attendees, vendors, or exhibitors that they want to meet. When attendees are near people they selected, their phones alert them, prompting amazing and productive conversations. In addition, vendors and exhibitors can collect information as a form of lead retrieval without having to physically exchange information. iBeacon technology can aid in event components like registration, content delivery, and automated check in. However it is used, event attendees love mobile event apps that incorporate iBeacon technology! There’s no denying that the last ten years have brought many changes to the world of meetings and events, most notably the way in which attendees experience events. Meetings were once a one-sided experience, where attendees would enter a smoke & coffee filled room, sit in classroom style rows, and jot down note after note as the speaker shared his or her message. Attendees at events now crave a more interactive experience, which is why one feature attendees love in mobile event apps is live polling. Live polling allows speakers to engage with the audience, asking questions and reporting answers in real time. 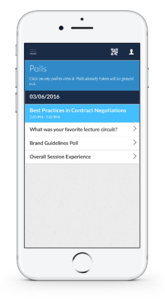 The attendees can provide their responses in their mobile event apps, and when completed (or a set period has passed), the speaker can incorporate the results of the live poll directly into his or her PowerPoint presentation, for all to see, in real time. Cool, huh? We think so too, and attendees love it, which explains why it is such a frequently requested feature! 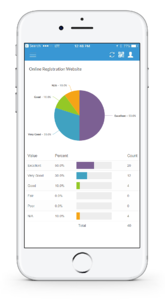 In light of the two-way experience that conferences and events have become, another must-have feature in mobile event apps is surveys. Surveys allow attendees to provide valuable feedback to the event organizers - having their voices heard and opinions shared. Surveys can be sent before an event or conference as a way of collecting data, requests, and other attendee information. If event professionals desire, they can utilize surveys various times throughout the event, such as at the end of day one, to make sure attendees have a pleasant experience and that the event is meeting their expectations. One of the best parts of surveys? Reminders and alerts of such surveys can be sent as push notifications at particular times (that can be pre-set) to attendees. Push notifications may not come to the forefront of attendees’ minds before an event when they think of which mobile event app features they desire the most. But we guarantee, after experiencing the convenience and power of push notifications at an event, suddenly this mobile event app feature quickly becomes one of the most requested event app features by attendees. Unlike SMS messages that land in event attendees’ message boxes, and are many times left unseen, undelivered, or even deleted before being read or even opened, push notifications go directly to the top of an attendee’s screen (if the event's mobile event app has been downloaded). Push notifications ensure that attendees see the message. 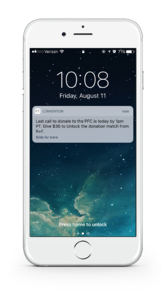 Push notifications have many uses, from attendee appointment reminders, last minute session location changes, or even as one of MeetingPlay’s clients learned recently – as an emergency alert to attendees. Push notifications, which can be sent to all attendees or a specific group of attendees, can be pre-scheduled by the event professional (or a dedicated MeetingPlay account manager), or they can be sent out last minute while on site of the event (as the client above was able to utilize!). Mobile event apps can be so much more than a replacement/duplicate copy of the event or meeting program. Personalized agendas allow each event attendee to experience and navigate events with ease. 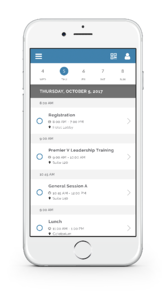 Attendees can choose from within the mobile event app which breakout sessions they want to be part of, highlight specific meetings or sessions they don’t want to miss, and more. Or, if breakout groups have been predetermined, personalized agendas can be pre-loaded into the app so that each attendee sees only the sessions that he or she has been assigned. A feature that attendees enjoy most, yet is often overlooked by event planners, is gamification. 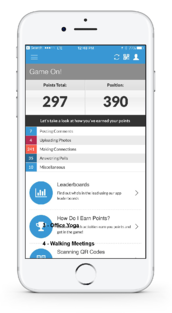 Event app gamification can happen in a variety of ways, at multiple times, and with various purposes and goals in mind. Every attendee has favorite mobile event app features, and every event has its purpose and goals for having a mobile event app. Creating an app that provides value, purpose, and opportunity is a must – but just as important is the fun, utilization, and draw for attendees to download and engage with the event app. Combining the event’s goals and needs with allowing the event app to incorporate the multiple features that attendees desire the most will lead to higher event app adoption rates, engaged and satisfied attendees and sponsors, and an event experience that is memorable! Learn how MeetingPlay’s mobile event app features can meet the goals of your next event while delighting your attendees!